I can not tell you how excited I am about my new logo! I mean I'm biased, but I think it is pretty freaking awesome. I have to say a huge THANK YOU to Todd and Brian!!! Brian the logo is perfect! You guys are the best and there are definitely baked goods coming your way Brian as the gift basket above was delivered to Todd already. 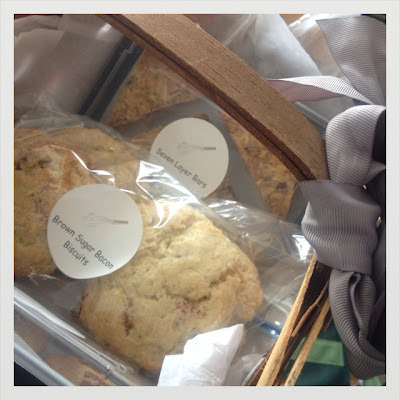 This basket was filled with Milky Way cookies, mini crumble apple pies, brown sugar bacon biscuits, seven layer bars, carrot cake cupcakes and dark chocolate salted caramel toffee (see below). I had fun baking all of these goodies in one weekend...okay well that statement is kind of a lie...lets get real, washing dishes gets old. So, lets talk about this toffee. Okay I have to fess-up here, this was not originally supposed to be toffee...it was supposed to be chewy caramel. 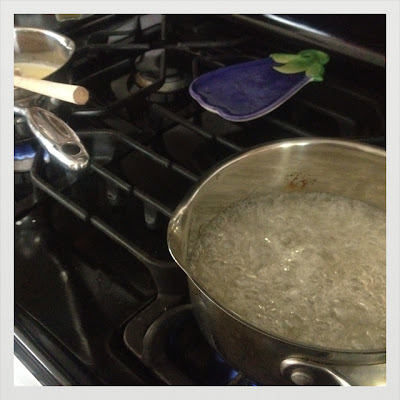 I tried making caramel without a candy thermometer...or really any kitchen thermometer at all. I do not recommend doing this, but you can make a nice toffee from it. This toffee is dark, salty and chocolaty. It is sweet, without being too sweet and almost has a sort of earthy undertone because of how long the sugar cooks for. Yes, I know this might sound weird, but everyone in my office liked it. So my mistake turned into a delicious toffee...I can totally accept that and next time I will just make sure to have the thermometer ready when I attempt to make caramel. Well enjoy! 1. Line an 8-inch square baking pan with parchment paper, then brush the paper lightly with oil, allowing the paper to drape over 2 sides. 2. In a deep saucepan (6 inches wide x 4½ inches deep), combine 1/4 cup water, the sugar and corn syrup and bring them to a boil over medium-high heat. Boil until the mixture is a warm golden brown. Don’t stir – just swirl the pan to mix. Watch carefully, as it will burn quickly at the end. 3. In the meantime, in a small pan, bring the cream, butter, and 1 teaspoon of fleur de sel to a simmer over medium heat. Turn off the heat and set aside. 4. When the sugar mixture is a warm golden color, turn off the heat and slowly add the cream mixture to the sugar mixture. Be careful - it will bubble up violently. Stir in the vanilla with a wooden spoon and cook over medium-low heat for about 16-20 minutes. Very carefully (it’s hot!) pour the caramel into the prepared pan and refrigerate for a few hours, until firm. 5. When the toffee has cooled and hardened pry the sheet from the pan onto a cutting board. 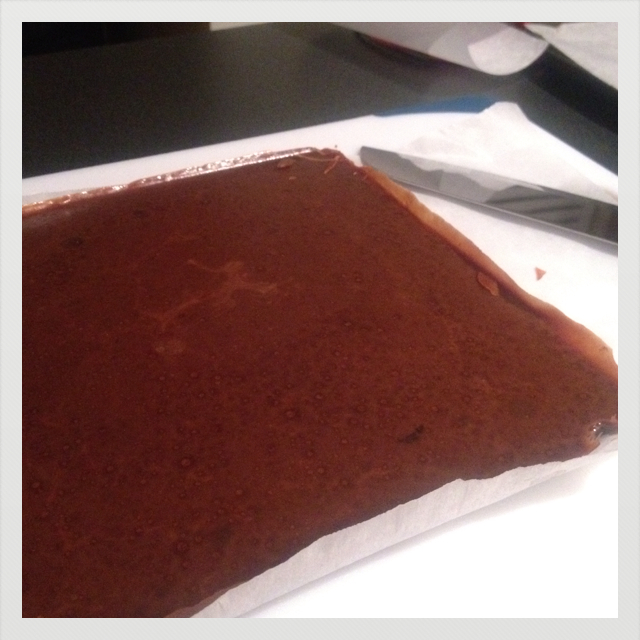 Break the toffee into the desired size pieces. Then using a double boiler, melt 1 cup dark chocolate. 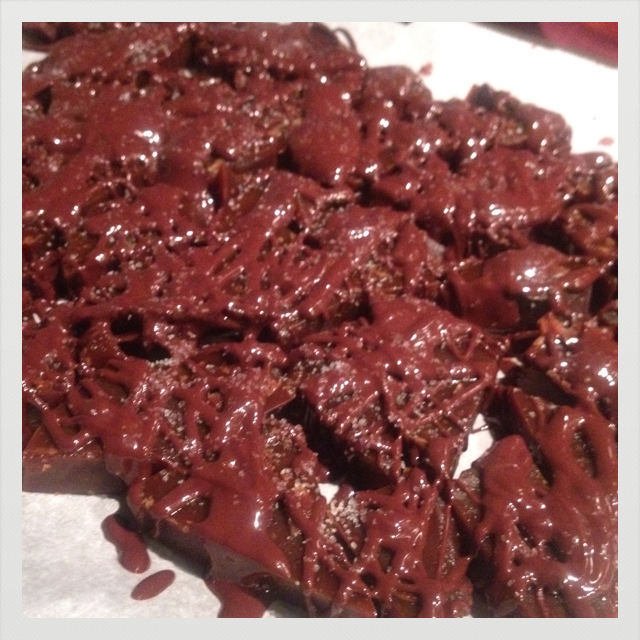 Drizzle the melted chocolate over the toffee pieces and sprinkle with sea salt. Store in an airtight container and enjoy! New logo looks fantastic! It's so real now - how exciting!! 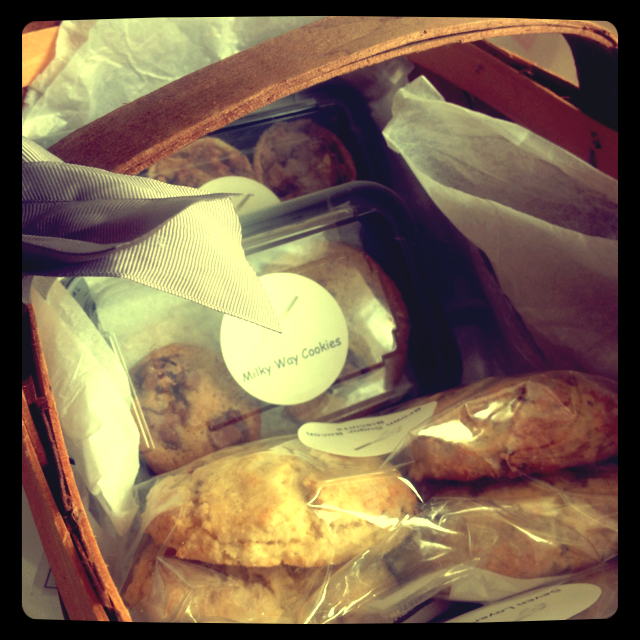 A baking weekend for the DC Grey Market!